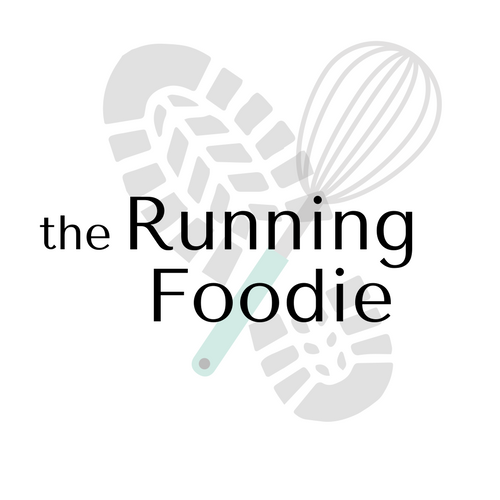 We're back, and this time in a pastry challenge worthy of a spot at the Olympics! This challenge was brought to us by Fran from Apples Peaches Pumpkin Pie, Ivonne from Cream Puffs in Venice, Lis from La Mia Cucina, and Shea from Whiskful. An Opéra Cake is made up of five components: the jaconde, an almond sponge cake, a simple syrup to moisten the jaconde, a buttercream to fill some of the layers, a mousse to make up one of the layers, and a ganache to glaze the top. We were instructed to keep the flavors "light" -- no chocolate, cocoa, or coffee, and the color had to be light as well. Going ahead with that train of thought, I decided to turn my Opéra Cake into a "White Forest Cake"; white chocolate making up the ganache as per the given recipe, and cherry puree making up the simple syrup, buttercream, and mousse. It was my dad's birthday, and I typically make him a Black Forest Cake, though a walk on the light side is always a good idea. After making all the components, I proceeded the next day with the assembly of the cake. In this picture, I have brushed the first layer with cherry simple syrup, flavored with the most hideous kirsch I've ever smelled. Here is the mousse layer. Very light and airy, though the cherry taste was missing. I pureed my own mix of frozen dark cherries with a bit of sugar, but I think I either needed to use sour cherries or add more sugar. This is the completely assembled cake, finished with a layer of French buttercream. 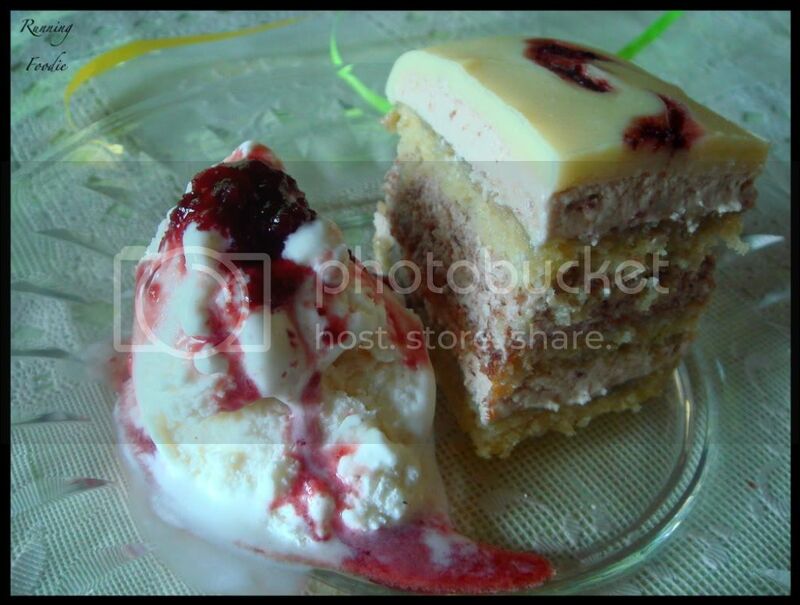 The buttercream curdled a bit after I added some of the cherry puree, but it remained smooth in feel. Maybe I reduced the butter by too much, as I used 2 1/2 sticks instead of 3 1/2, and perhaps I should have used at least 2 3/4, but I don't know. Also, the Swiss buttercream I made from the Perfect Party Cake challenge was not as achingly sweet as this was, but when fully assembled it wasn't overpowering. After setting in the fridge, a white chocolate ganache was poured on top. For extra flair, I decided to add drops of the remaining cherry syrup (I probably could have brushed more of it on the layers) and create a marbleized design. When we were ready to have Dad's birthday Opéra Cake, I sliced and served everyone a piece. The overall reviews were in the positive, though we all agreed that it didn't really have much of a cherry taste. The jaconde was a favorite because it was light, nutty, and paired well against the smoothness from the buttercream and mousse. The mousse was favored for it's slight difference from the buttercream in that it wasn't as sweet and was more billowy, but the texture was smooth and very much "in rhythm" with the other components. As for the buttercream, it wasn't too sweet against the jaconde and mousse, but was slightly sturdier and basically, in both a different-yet-similar way of the mousse, was within the texture and feel of the jaconde and mousse. The white chocolate ganache, however, was really off. It's waxy, plasticy texture was a complete difference, and I couldn't even cut through it without all the fillings of the cake oozing out. I would have preferred a shell of just melted white chocolate to the waxiness of the ganache. We all enjoyed another slice as a Memorial Day treat served with vanilla bean ice cream drizzled with cherry puree-syrup. Thanks to the hosts for giving me a push! This recipe is one I might have noted, but put off until I forgot about it. Once again, I have expanded my baking repertoire! 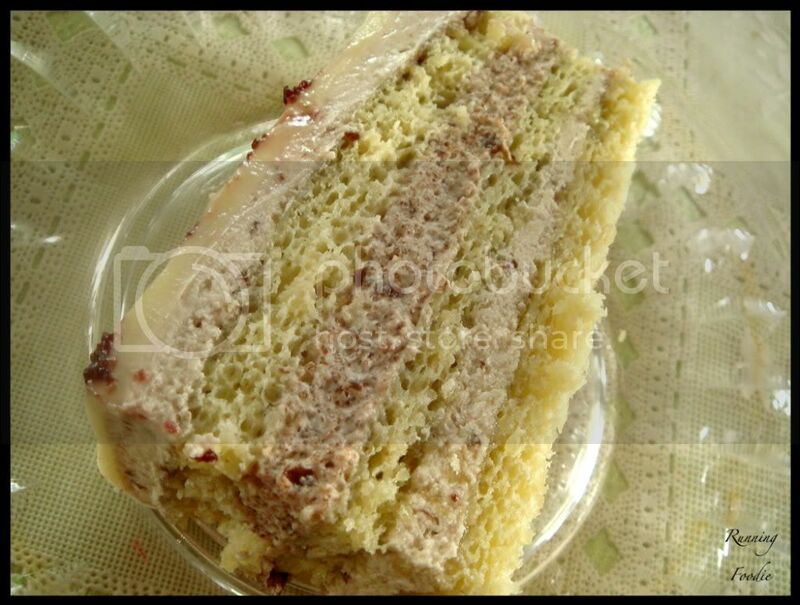 Don't forget to peruse the Daring Bakers' Blogroll to read other tales of the Opéra Cake. This recipe was posted by Pam from Sugar Chef. The recipe is from the original posted by the hosts, but changed to make it fruit-flavored and with a fruit mousse instead of a white chocolate mousse. A big thank you from me to Pam, as I was looking for a way to incorporate fruit, but I didn't exactly know how to proceed. Cut the cake so you have one piece 10” x 10” and one piece 10” x 5”. Repeat with the other cake. You will have two 10” X 10” and two 10” x 5”. 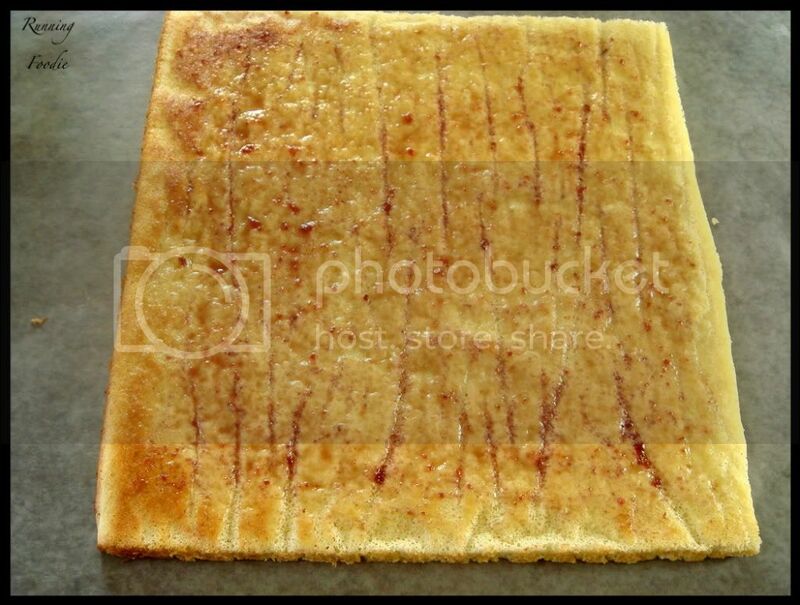 Put one of the 10” pieces on the parchment lined baking sheet. Moisten it with the peach syrup using a brush. 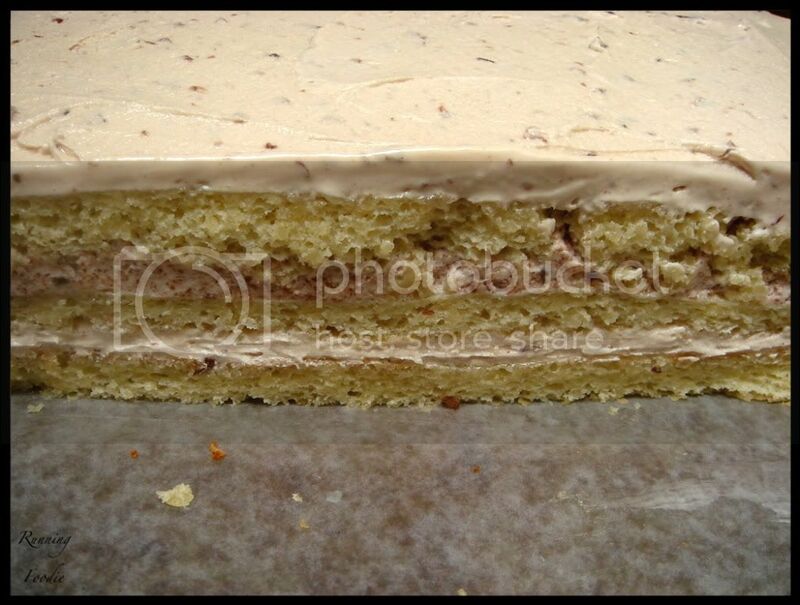 Spread a ¼” thick layer of peach buttercream over the cake. Put small diced pieces of fresh peach over the buttercream and push them down into the buttercream. Put the two pieces of cake that measure 10” x 5” over this, fitting them together so you have a 10” x 10” square. Moisten with the peach syrup. Put the last 10” square cake on top of the mousse layer. Moisten with the peach syrup. 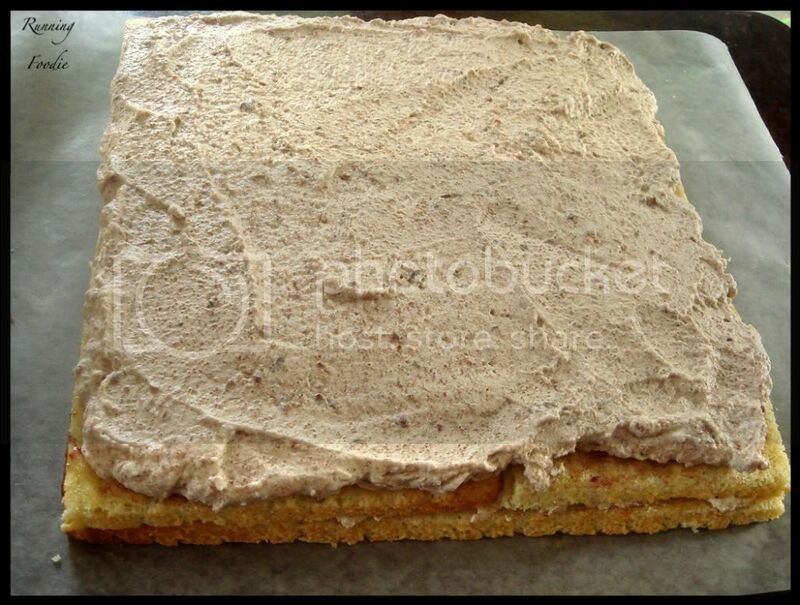 Spread a ¼” thick layer of peach buttercream over the cake. Refrigerate at least 30 minutes. Nice job! The addition of cherries sounds so good! neat! a white forest cake! great job! That looks so good! 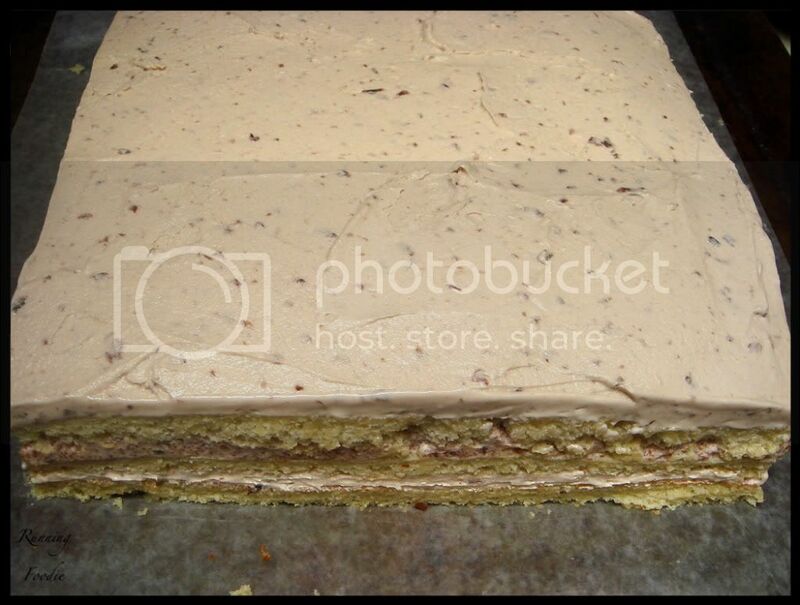 I'm getting really hungry for Opera Cake. Looks absolutely yummilious ... wish I was having a piece now. Love the combination! Positively gorgeous!!! Bravo!! 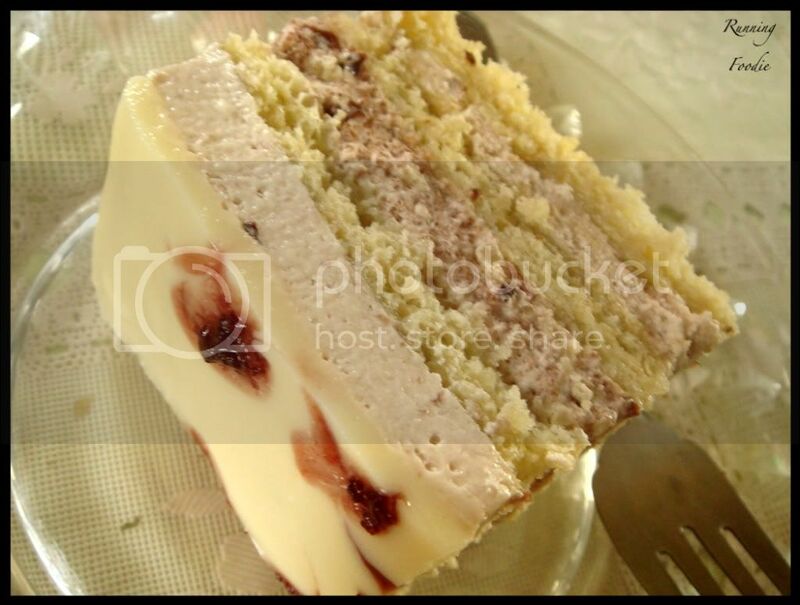 I love the white forest cake concept - pure genus! Beautiful end result - well done! I do like the idea of a cherry flavoured opera cake, even if it didn't quite come out in the end result. Great job! 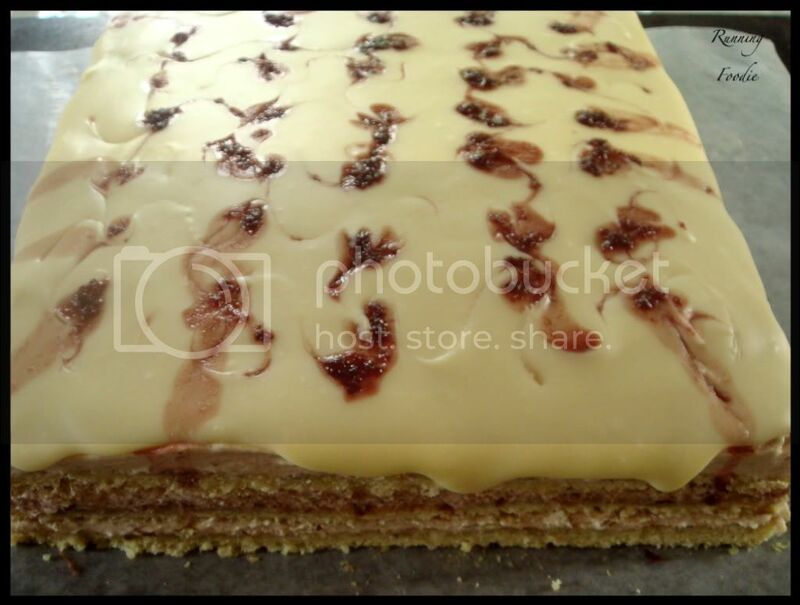 I love cherries - what a great idea for the Opera Cake. Well Christina, I'd say you definitely were daring with the flavor change to a white forest cake! What a nice birthday cake for your dad. And yes, if it wasn't for Daring Bakers I never would have pushed myself to make things like puff pastry and an Opera Cake either. Always glad to bake with you. Looks great Christina! I like how you decorated the top - very dramatic. I really love the idea of a white forest cake- I just might have to do some interpretation of that myself! It looks lovely. Sorry you didn't like the kirsch - I have a pumpkin cheesecake recipe that uses kirsch, where it really just adds a depth to the flavor making it light and fantastic, if you are interested. Looks great! I used cherries in mine as well...LOVE the White Forest name! Black forest cake is one of my favorite desserts, so it was interesting to see your interpretation. When it comes to kirsch, I think all brands taste like jet fuel. It doesn't really matter which you buy. I use it quite often--I like to sprinkle a tablespoon or two over sliced strawberries before adding sugar and using them in a pie or strawberry shortcake. I just have a bottle of the cheapie Arrow brand in my pantry. For more of a cherry flavor, it might have been better to use sour pie cherries. I've noticed they really "bring it" to desserts, much more so than regular sweet eating cherries. Anywho, your cake looks and sounds great! Dena - Thanks! 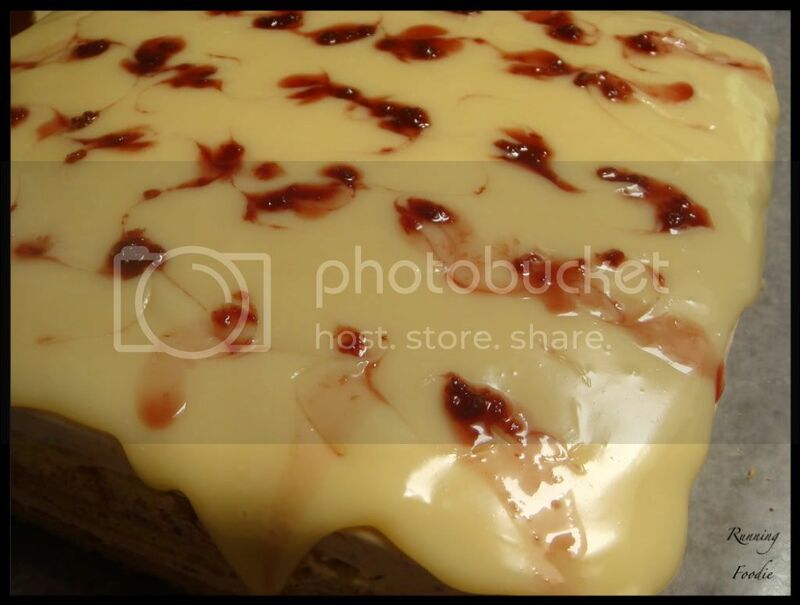 White chocolate and cherry is a nice combination. Ben - It really was! It also gave me a chance to work on buttercreams and sponge cakes again, so the intensity was worth it. Emiline - If I could, I'd give you the remaining section that is still in the fridge! Jo - It certainly is one of those desserts that make you crave it when you look at a picture! Thanks for commenting. Astra Libris - Thank you! I wonder if a black-white forest cake would also be good, like the black-and-white cookie, but with cherries. Cakelaw - I'm definitely going to work on the flavoring aspect. I must get it to work! Mary - Thanks, same here! It was more intensive than the other cake, if only because I haven't made it before, but it was definitely worth it. Canadian Baker - I needed to keep coming up with ways to use the remaining cherry puree. I still have most of it in the fridge! 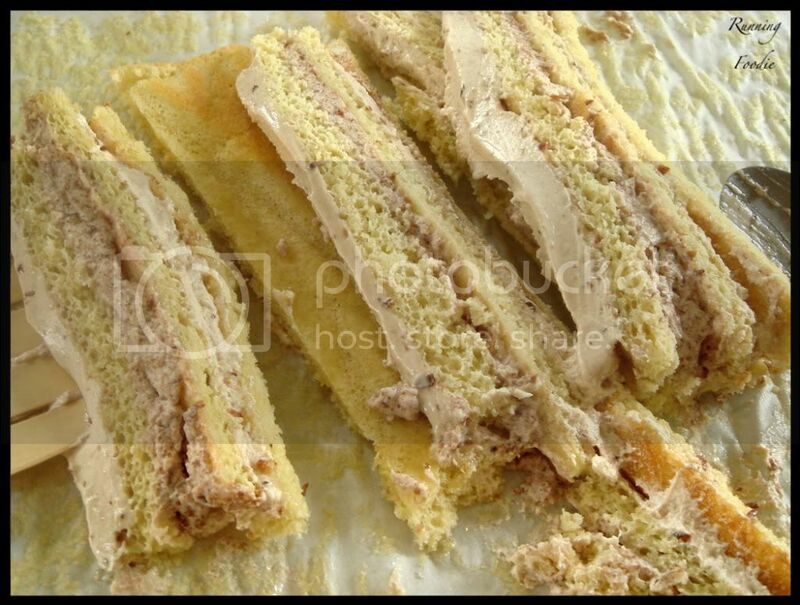 Hannah - I'd also like to try it in mini-cake form, but not a n opera cake, just a regular version. 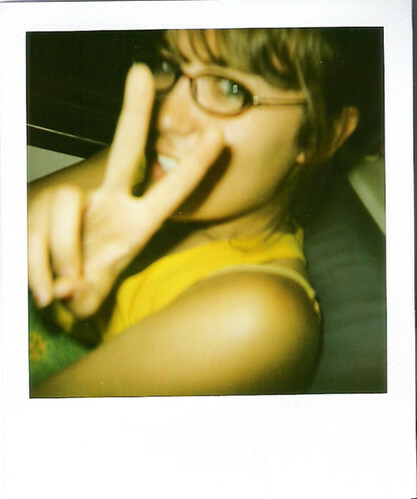 Julie - It's strange. Grand Marnier actually smells of orange to me, I just assumed kirsch would, also. Jenny - Ah, no, I like kirsch, I just didn't think this one was particularly good, though I didn't really know if it was me or the kirsch. As I said, it was made from the cherry pit instead of the cherry meat. The recipe sounds really intriguing. I'd love to have a look at it, if you don't mind! NatNibbles - I keep thinking of snow-dusted castles, actually! Rebecca - Great, thanks for the tips! I concur, I knew I should have used sour cherries, which is what I use for pies, but I... didn't? Hm. I think I made this mistake before in another cake, actually. A white Forest is a Brilliant Idea. Love it. White forest - inspired! For some reason it reminds me of the forest at the beginning of The Lion, The Witch, and The Wardrobe. Don't ask. I'm weird that way. I almost went the cherry/kirsch route too. (I love me some black forest...) It looks so yummy! I've never had kirsch. Or cherry listerine. Love me some of that codeine cough syrup though :) There I go, bein' all helpful again. Hey, nicely done - I love the idea of using black forest cake as inspiration...and cherry is a great idea to cut the sweetness! I love the flavors you chose! Beautiful! Yummers!!! Good work... it looks o so very tasty! Nice flavors and your mousse looks perfect! I like the idea of a white forest cake, even if the kirch was a little off-putting. The end result looks sensational! A white forest cake is very creative! Great job! It came out looking great Christina! Too bad that some parts were not as good or were not what you expected. This was Olympian! Lovely cake.